Elegantly crafted like the 1st Gen of Anne pro, the features like smoothed and rounded plastic chassis, PBT keycaps, carefully stenciled legends are still with Ann Pro 2, to continue provide the physical support of excellent typing or gaming experience. 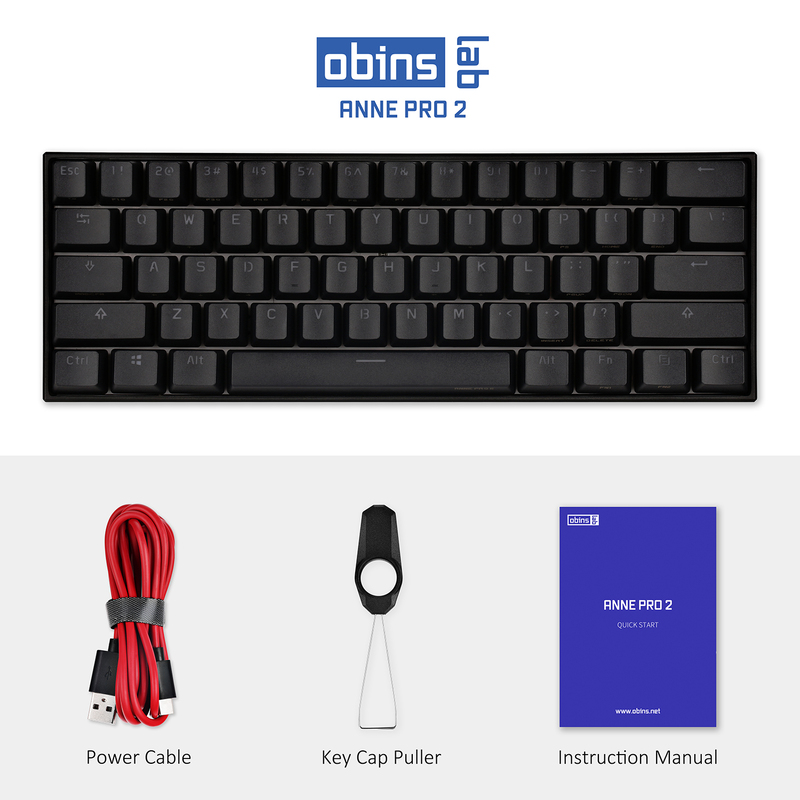 Other than that, Ann Pro 2 resolve the most concerned issue on 1st Gen- The Bluetooth connectivity, short battery life and arrow keys. 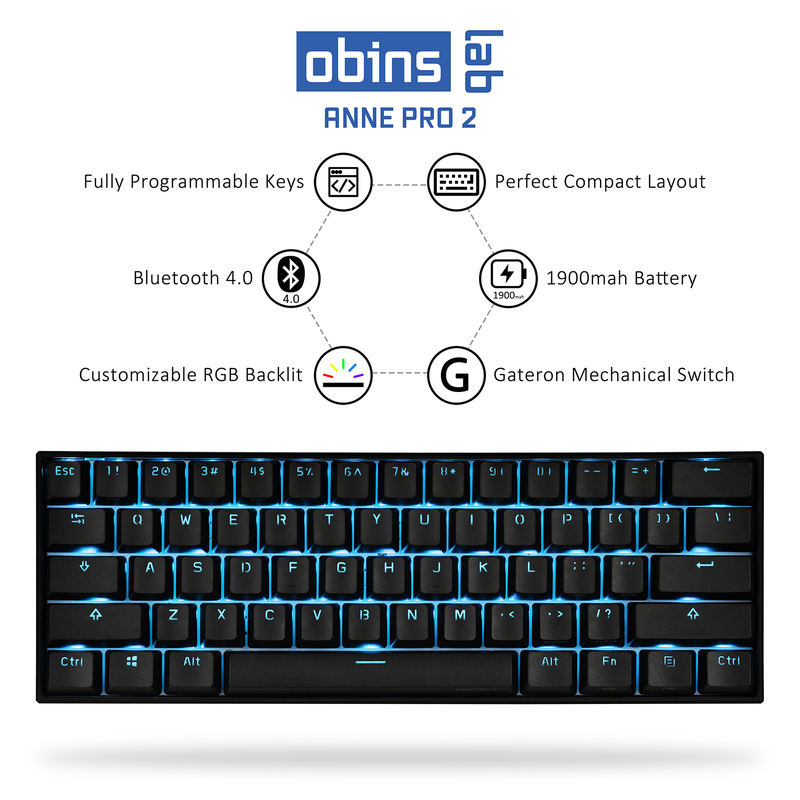 Anne Pro 2 also replace the mobile APP with ObinsLab Starter Companion Software, for easier operation. 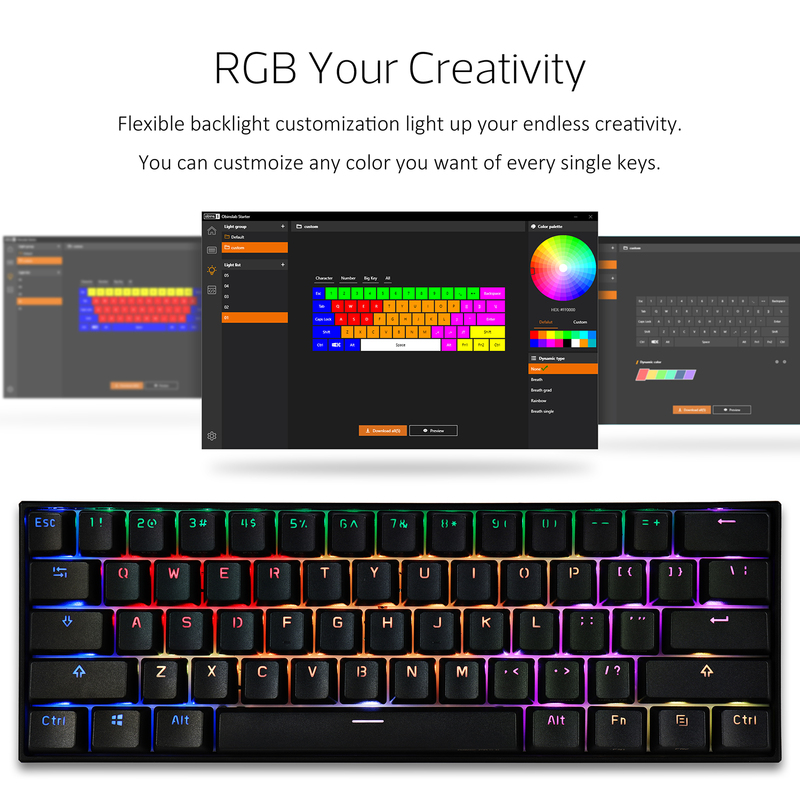 Love the Anne Pro 2 but miss the flexibility of using a QMK compatible board? No problem! 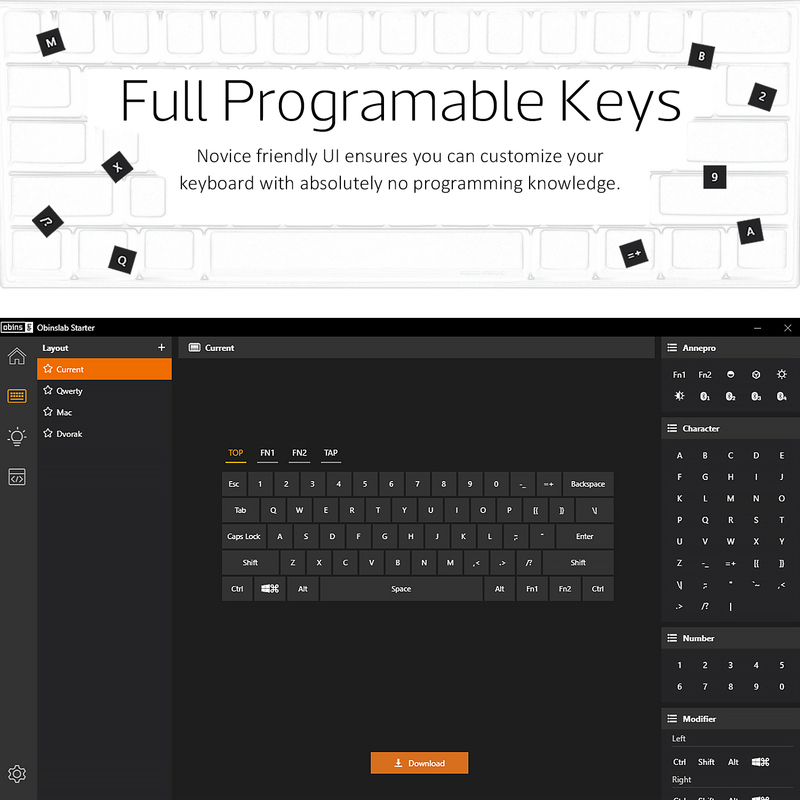 All keys on the keyboard can be remapped to become any key you want through ObinsLab Starter. Lighting can also be reprogrammed through ObinsLab Starter. RGB backlights are individually addressable and dynamic lighting effects can also be programmed as well. Lighting profiles can be created, saved, and loaded to the keyboard through the software. Keyboard firmware updating is done entirely through ObinsLab Starter, and is much easier than compared to the process for the 1st Gen Anne Pro. Just plug the USB cable into the board, press update, and the software will automatically download and transfer the firmware update to the board. Up to 16 key macros can be programmed through the computer software. Saved macros are stored onto the keyboard onboard memory and do not need the use of the computer software to activate. Works like a dream, far less buggy than the original Anne. There are some great new functions and the downloadable Obins software makes updating and changing your settings super easy. This is honestly my favorite keyboard I've ever used. Loving the keyboard so far. Gateron Reds just have a much more satisfying feel than Cherry's. My only real complaint is that the Legend font is pretty ugly and I wish they went with a more standard looking character set. I'll probably replace the keycaps as a result. The legend is usable though, so if you're looking for a great 60% with the Bluetooth option, this is definitely your device. The Anne pro will connect to my iPhone 7 just fine but the app says there is nothing connected? Will I be able to type on an iPad with this keyboard? How long does the battery last with and without lighting respectively? What about standby? 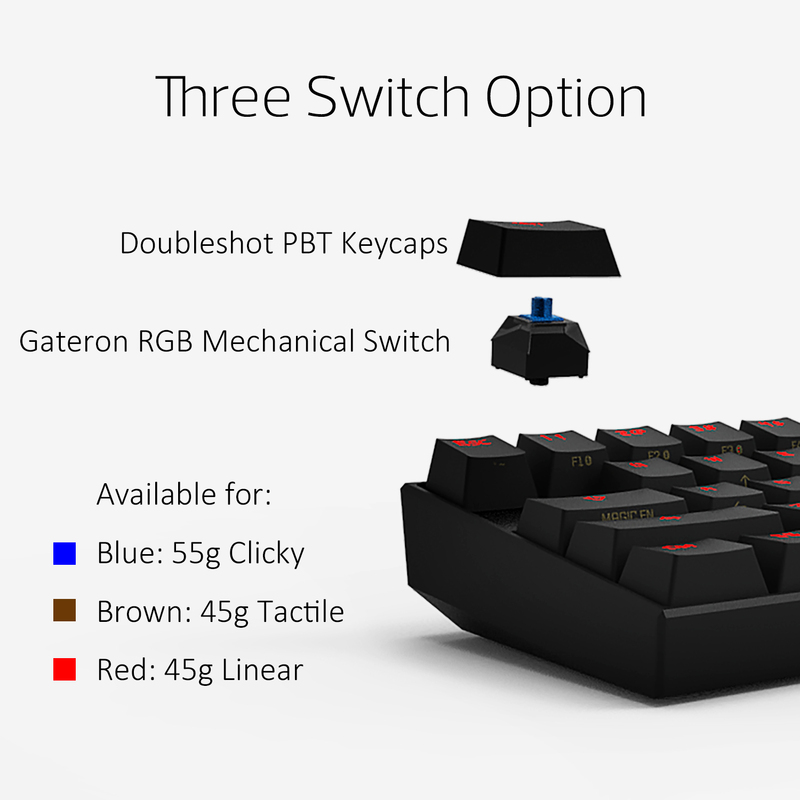 How do I choose the switch type (red, brown, blue)?